College football’s regular season is just about halfway complete. It’s time for another edition of the mid-major betting report. 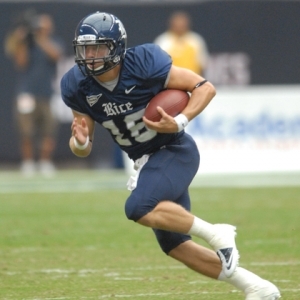 This report focuses on the Rice Owls, who were selected at random before the season started. Doc’s Sports is all about finding that little extra edge on the books. I’ll be following the team’s press conferences, following players on Twitter, and reading reports from beat writers to find every little nugget of information about this team. The point of this series is to show that specialization can be profitable. At the end of each report, I make a selection on this week’s Rice game. We will be using Doc’s Sports Unit Betting System for every pick, which will help readers follow along and track the results of these college football picks. The Owls picked up a 28-6 victory over the Memphis Tigers last weekend. Before Rice fans get too excited, it’s important to point out that Memphis has won just one game in the past two years against an FBS-level team. The Rice offense surprisingly struggled to get going against a Memphis defense that ranks as one of the worst in all of football. Taylor McHargue threw two interceptions, and the team also lost a fumble. On the other side of the football, the Rice defense played extremely well last week. Last week’s game against Memphis marked the first time since 1995 that Rice did not allow a touchdown. Just as impressive is the fact that Rice had 10 tackles for loss last week, including five quarterback sacks. If the team is going to trend upward in the second half of the season, the defense must continue to show improvement. --Rice’s opponent this week, Marshall, is the only team in the country without a rushing touchdown all season. Marshall is averaging just 10 points per game during their last four contests. The Thundering Herd rank 113th in the nation in rushing offense, but the Rice defense is ranked 118th in rushing yards allowed per contest. Will the Rice defense step up against the poor offense or will Marshall’s running game find its footing? --Coach David Bailiff said in this week’s press conference that a major point of emphasis for the Owls is to get improved blocking in the interior of their offensive line. Bailiff believes that the offense really needs to be able to open up some seams in the middle of the defense rather than just trying to run around the outside every time. -The Rice defense has still been giving up big plays, but they are improving when it comes to getting off the field. Rice is allowing opponents to convert on just 37 percent of their third-down conversion attempts this year compared to 51 percent in 2010 and 44 percent in 2009. -Rice is 0-7 ATS in their last 7 road games. -Marshall is 4-0-1 ATS in their last 5 home games. -The ‘over’ is 38-13 in the Owls last 51 road games. -The ‘under’ is 10-2 in Marshall’s last 12 games overall. The college football betting odds in this game have been remarkably stable throughout the week. Marshall is currently listed as a five-point home favorite in this one. The posted total opened at 51.5 points, and it has not fluctuated at all from that level. Last week’s win over Memphis was a confidence booster for the Owls, but the Tigers will be the worst team Rice plays all season. Marshall isn’t very good, but they are a much better team on their home field. Rice has the talent to win this game, but they will have to take care of the football. I really don’t see any value on the side in this game. The total is where I believe the value is in this game. The Rice defense has played well against poor offenses this year, and Marshall definitely fits into that category. Rice is struggling offensively, and the Thundering Herd defense is pretty solid. I think both defenses will play well in this one. My pick for this game is ‘under’ 51.5 points. Keep an eye out for next week’s report, which will feature a preview and pick for the Owls meeting with Tulsa.